The Beavers wipe out a 15-point deficit to top the Huskies. GORHAM — Milani Hicks, a Scarborough High grad, had 19 of his game-high 25 points in the second half Tuesday night as UMaine-Farmington rallied to beat the University of Southern Maine 77-72 in a nonconference men’s basketball game. The Beavers (13-6) rallied from a 45-30 deficit to down the Huskies (4-15). Amir Moss had 15 points for Maine-Farmington. Christian McCue led Southern Maine with 23 points. SOUTHERN MAINE CC 66, UM-MACHIAS 58: Gregory Trinidad hit a 3-pointer with 6:27 to play in regulation to cap a 7-0 run midway through the fourth quarter as the Seawolves (17-3,12-1 YSCC) took control against the Clippers (8-13, 6-6) at Machias. Ryan Cloutier had 16 points to lead four SMCC players in double figures. Dante Ramos paced UMaine-Machias with 16 points. (1) TENNESSEE 92, SOUTH CAROLINA 70: Admiral Schofield had 20 of his 24 points in the second half to lead the visiting Vols (19-1, 7-0 Southeastern Conference) to their school record-tying 15th straight victory. Grant Williams added 23 points for the Vols, who saw a double-digit lead cut to 60-58 with 13 minutes to play. Jordan Bone then scored five straight points to start an 18-6 run over the next six minutes that helped Tennessee stay perfect in SEC play. 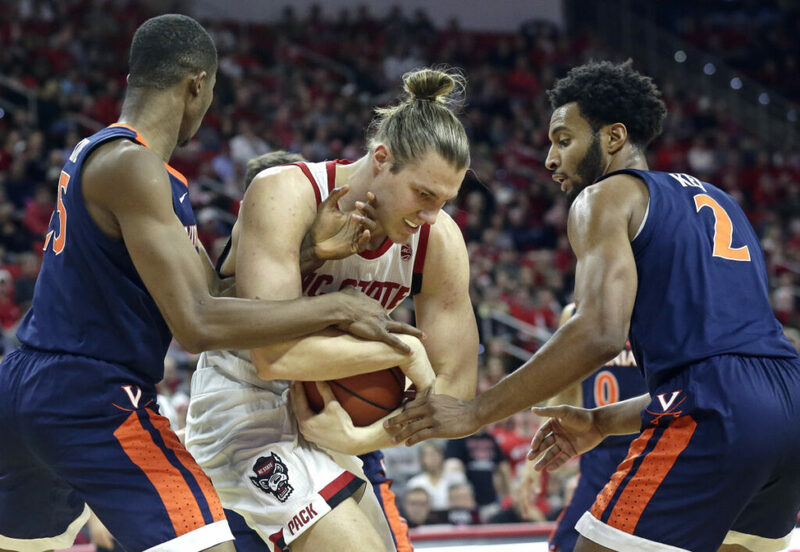 (3) VIRGINIA 66, (23) N.C. STATE 65: Kyle Guy hit the go-ahead 3-pointer with two minutes left in overtime to help the visiting Cavaliers (19-1, 7-1 Atlantic Coast Conference) top the Wolfpack (16-5, 4-4). (9) NORTH CAROLINA 77, GEORGIA TECH 54: Cameron Johnson scored 22 points and the visiting Tar Heels (16-4, 6-1 ACC) topped Yellow Jackets (11-10, 3-5) for their fourth straight win. TEXAS 73, (11) KANSAS 63: Dylan Osetkowksi scored 16 points and the host Longhorns (12-9, 4-4 Big 12) used stifling defense to snap a 10-game losing streak to the Jayhawks (16-5, 5-3). (18) BUFFALO 83, BALL STATE 59: Dontay Caruthers scored 21 points and the Bulls (19-2, 7-1 Mid-American Conference) topped the Cardinals (11-10, 2-6) for their 21st straight home victory. SOUTHERN MAINE CC 78, UM-MACHIAS 51: Amanda Brett had 27 of her game-high 34 points in the second half as the Seawolves (17-2,12-1 Yankee Small College) downed the Clippers (3-7,9-3) at Machias. BOWDOIN 93, NEW ENGLAND COLLEGE 42: Taylor Choate scored a game-high 18 points to lead four double-digit scorers and the top-ranked Polar Bears (20-0) held the Pilgrims (11-8) to 13 points in the second half en route to a win at Brunswick. COLBY 72, SOUTHERN MAINE 63: The Mules (8-11) held their opponents scoreless in overtime as they outlasted the Huskies (12-7) in a nonconference game at Waterville. Ainsley Burns and Keegan Dunbar put in 17 points each to lead Colby. USM’s Victoria Harris had a game-high 18 points. BATES 61, REGIS 31: Meghan Graff scored 11 of her game-high 17 points in the first half and the Bobcats (9-10) outscored the Pride (7-13) 34-12 after halftime to get the win at Lewiston. Erika Lamere added nine points with seven rebounds for the Bobcats. UNIVERSITY OF NEW ENGLAND 4, WESLEYAN 3: Shannon Nadeau scored the winning goal with 3:08 remaining after the Nor’easters (14-6-1) gave up a 3-0 lead to slip past the Cardinals (5-11-1) at Middletown, Connecticut. Carly Perreault scored 13 seconds into the game for UNE, and Jessica Tolzman and Kyra Yu each scored in the second. SOUTHERN MAINE 4, COLBY 2: The Huskies (4-15-3) raced to a 3-0 lead and held on to defeat the Mules (7-8-3) at Gorham. Colby cut the lead to 3-2 with two goals to start the third period, before Matt Fuller scored to increase the Southern Maine lead to 4-2. Paul Leger stopped 24 shots for Southern Maine and Andrew Tucci and Joe MacDonald each had seven saves for Colby.